Everything you need to get started and bead your own browband, halter, belt, or dog collar. Finally 120" of 15lb fishing line. Here's a fun idea! Design your own browband with these blank ones! Easy to do! Lots of great websites sell fabulous beads, gemstones, pearls, and Swarovski crystals of any color, choose your favorites and simply string them together and sew each end of the string down on either side of the channel, add glue or extra stitches for extra stability if needed. There are lots of ways to do it. 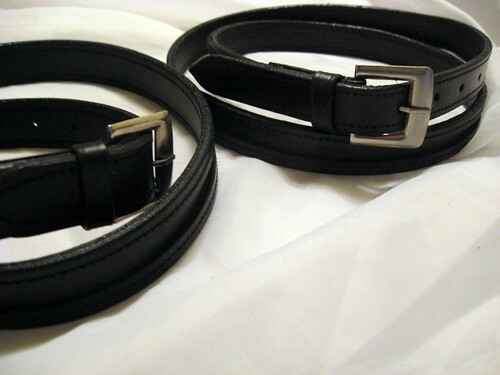 High quality leather belts with empty channels you can put your own beads and decorations into! In stock and available with 8mm channels and removable buckles so you can add your own fancy buckle set. A perfect finishing touch to your show outfit also makes a great crafts project for kids and adults. Combine with matching dog collars, horse halters and browbands- they make great gifts for horse and dog lovers, prizes for dog and horse shows and agility competitions, or fundraisers for your animal rescue. Ebay is a great source for high quality beads and beading supply at great prices. Email delfinasaddlery@yahoo.com if you would like a custom belt with a different channel size. Soft padded empty channel nosebands for beading. Crank style French cavesson. 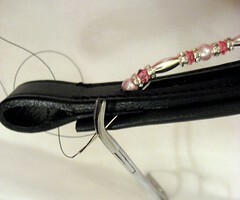 Detailed instructions with photos showing how to bead your own browband, halter, dog collar or belt! Includes supplies needed and where to buy them. 10 pages, pdf format. Email crystal@delfinasaddlery.com if you would like it sent to you in a different format. Here's a fun idea! Design your own browband with these blank ones! Easy to do! Lots of great websites sell fabulous beads, gemstones, pearls, and Swarovski crystals of any color, choose your favorites and simply string them together and sew each end of the string down on either side of the channel, add glue or extra stitches for extra stability if needed. There's lots of ways to do it. Fabulous! High quality leather halters with 8mm blank channels you can add your own beads to! Great for fun or profit! Hand beaded halters are the new popular style, they make great horse show awards, gifts, Pony Club fundraising projects, and a fun craft project for kids and adults! Use these great halters made with super soft padded leather and brass buckles to make a work of art for your horse. Ebay is a great source for high quality, low cost beads and beading supplies! High quality soft padded black leather dog collars with empty channels you can put your own beads and decorations into! High quality chrome hardware! A great crafts project for kids and adults. They make great gifts for dog lovers, prizes for dog shows and agility competitions, fundraisers for your animal rescue.